Exposure to Monochromatic Blue Light. 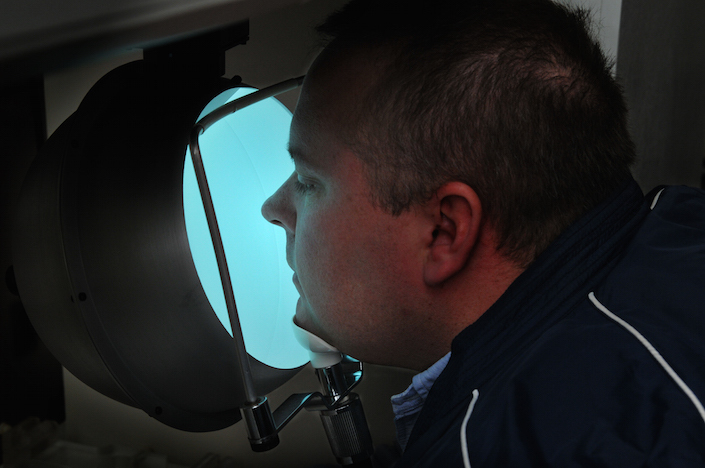 A study subject undergoes Ganzfeld exposure to monochromatic blue light at Jefferson Medical College of Thomas Jefferson University. Photo by Dave Super. Many factors can impact an astronaut’s ability to work well in space. The same can be said for the ground support crew’s efforts on Earth. The Human Factors and Performance Team is studying ways to improve daily living and keep crewmembers and other personnel healthy, productive and safe during long-duration space missions. Overall Team aims are to reduce performance errors and mitigate habitability, environmental and behavioral factors that pose significant risks to mission success. The Team develops guidelines for human systems design and information tools to support crew performance. Team members are examining ways to improve sleep and scheduling of work shifts as well as how specific types of lighting in the spacecraft and habitat can improve alertness and performance. Other projects address improving the interactions between automated and manual control of a spacecraft and how environmental factors, such as moon or Martian dust, can impact crew health. In addition to the benefits to space exploration, the Team’s efforts will benefit health and reduce errors and accidents on Earth in a wide range of professions, such as military and civilian aviation. The Human Factors and Performance Team’s research is intended to accelerate progress on countermeasures that reduce the risk of human performance failure and maximize performance capabilities during space exploration. A system for predicting and preventing the deposition of lunar and Mars dust in the lung. Improved ability to target drugs to specific areas of the lung, making it possible to achieve optimal results with small quantities of drugs and to minimize side effects.